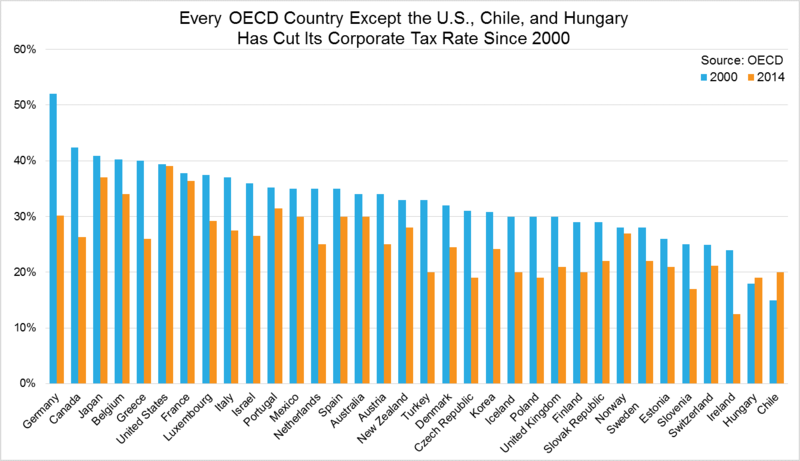 The United States, Chile, and Hungary are the only three OECD countries that have not cut their corporate tax rate since 2000. Hungary and Chile, who had the two lowest rates in the OECD in 2000, have both increased their rates to 19 and 20 percent, respectively. Germany has cut its rate the most in this timeframe, going from 52 percent in 2000 to 30.2 percent in 2014. Canada, Ireland, Poland, and the U.K., among other, have also made large cuts to their corporate tax rate. In all, 14 of the 34 OECD countries have lowered their corporate tax rates by at least 9 percentage points, with another 10 countires lowering their tax rates by at least 5 percentage points. The rate cuts by 31 of the OECD countries have led to a drop in the average corporate tax rate across the OECD from 32.6 percent to 25.3 percent between 2000 and 2014. If we go back even further, OECD countries have cut their corporate tax rates continuously, with the average falling from 47.5 percent in 1981. The U.S. has not changed its federal corporate tax rate since it increased the rate from 34 to 35 percent in 1994. Since 2000, the U.S. combined corporate tax rate (federal tax rate plus the average state corporate tax rate) has remain just above 39 percent. Updated to include more information.